At Wargrave Local History Society's June meeting, David Williams, the Finds Liaison Officer for East Berkshire and Surrey, gave an illustrated presentation about the Portable Antiquities Scheme - which exists to ensure that items of historic interest that are found are properly recorded. David began by outlining the legal position. The laws governing 'treasure trove' were replaced in 1996 by the Treasure Act, and resulting from this the Portable Antiquities Scheme was set up. This is based with the British Museum, and there is a Finds Liaison Officer for each county (occasionally shared between counties). Items that are found which are considered to be treasure must, legally, be reported to the coroner, whilst other items are recorded by the scheme. Many (but not all) items are discovered by metal detectorists, either working alone or as a club, maybe as a rally where several hundred people might descend on a field with their equipment. The situation is similar in some other countries, such as Denmark, Germany or the Netherlands, but in others, such as France the use of metal detectors is not allowed by law (although does go on), in Bulgaria it is to be banned, whilst in Iran it is said to be a hanging offence. Information about finds can be submitted in a number of ways - by the finder visiting the offices, or by contacting the Finds Liaison Officer at home, or by the Officer visiting metal detecting clubs. Everything dating from before 1700 is recorded, as are some from after that date, especially if they are the only surviving evidence of an important activity (such as recording local militia buttons from the Napoleonic War era). Recorded items are listed on an online database - so even if the finder reports the item to the Finds Liaison Officer in a different county, the information is accessible (although not the finder's name or precise location of the item). Items discovered in a particular parish can be listed using the advanced search at https://finds.org.uk/database/search. Any item of silver or gold over 300 years old, except single coins, is considered as 'treasure', as would be more than one silver or gold coin, or 10 or more bronze coins. A later amendment also classes 2 or more pre-historic base metal objects as treasure. The 'treasure' would include all the items in a 'find', so a pot that contained several silver or gold coins would also have to be reported under the Treasure Act. The police are very alert to the activities of those who make illegal searches, and failure to report such finds can lead to prosecution under the Theft Act. If an item is 'treasure', then a report is written about it by the Finds Liaison Officer or a curator at the British Museum, and a local museum would be asked if they wish to purchase it - if not it is returned to the finder. If a museum is interested in acquiring the object, it is considered by an independent treasure valuation committee - if the museum can raise the value, then they can purchase it, the proceeds normally then being split between the finder and the land owner. Although most items are found by metal detectorists (many that would not otherwise be found) some items are found in other ways. One, found at a car boot sale for £25, the finder suggested was a Saxon gold pendant. That seemed unlikely, but when seen by the experts was, with garnets and a glass centre. Sadly, as there was no indication as to who or where it had been found, it was difficult to fully record it. It was returned to the finder, who later sold it for £7,000. David also mentioned that not all the items brought in for recording are 'quite what they seem'. Some silver Elizabethan coins turned out to be relatively modern copies made of aluminium, whilst a brooch found near Wantage in 2013 was somewhat of a mystery. It did not appear to have been in the ground there for several hundred years, and was not of a style that might be anticipated to be found there. A photograph from an auction catalogue some 11 months before the 'find' was made illustrated exactly the same item, and subsequently a further item from the same sale was also 'found' in the Wantage area. They most likely are of East European origin, and not British Roman. Quite why they had been 'planted' there is not known, but it seems someone was trying to falsify the archaeological record. 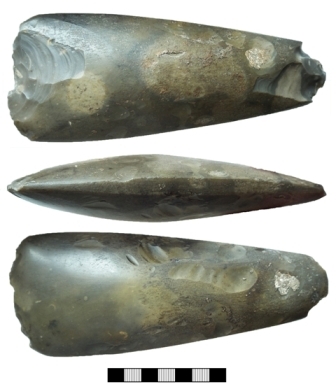 Not all the items recorded are metallic, and a fine Neolithic flint arrow head found by someone rotavating their garden was just one example David showed. It seemed to be more of a 'demonstration' piece than one intended to be fired. < Another interesting item was a seal, about the size of a postcard, found at Cobham. Probably dating from the 13th century, the inscription showed it to be for the priory of St Mary and St Wulfhade at Stone. Quite how it had come to be in Surrey, not its native Staffordshire, was not known. 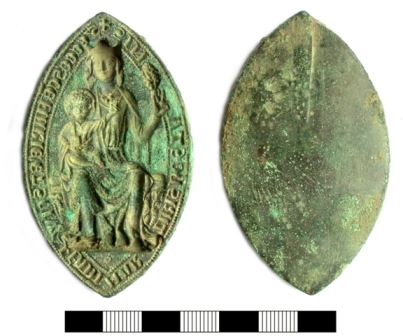 On checking with records at the British Library, it was found that they had an impression of a wax seal from the priory - close inspection showing it to have been made from the item found at Cobham. Another seal was found a few months ago near to the river Loddon. It is of medieval silver, inscribed "John is his name" (in Latin), surrounding a much older (probably Roman) piece of banded agate that is carved with a muse holding a book. This has been described as a 'nationally important object', so may be kept at the British Museum or the Ashmolean in Oxford. David showed several examples of items found 'locally' - a Roman cupid found at Waltham St Lawrence, some fine Neolithic axe flints of particularly good quality, and a Roman phallic pendant 'a very fine specimen', both found in Wargrave. David concluded by explaining some of the problems when a finder' notifies them of a discovery. Near Watlington, in 2015, what was thought to be a hoard of Viking coins was found. The finder was persuaded to stop excavating any more until a search could be made to reveal the context in which the items were lying. They could then be removed, complete with the surrounding block of soil, to a British Museum conservation laboratory, where they could be "excavated with the care it deserves". The hoard turned out to contain about 190 coins from Alfred the Great (of Wessex) and Ceolwulf (of Mercia) - adjoining kingdoms in the late 9th century, together with several finger shaped silver ingots, 3 bracelets, and fragments of a torc (necklace). 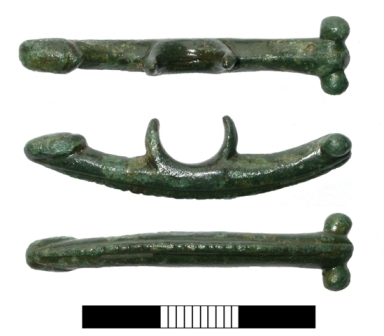 It was the first Viking hoard found in southern England since the 1860s. It has subsequently been declared to be treasure by the coroner. Metal detectorists are expected to follow a "Code of Practice for Responsible Metal Detecting" -getting permission from the land owner, keeping away from ancient monuments, and observing the provisions of the Treasure Act. The work of the Portable Antiquities Scheme is vital in identifying and recording what is found - regrettably now with decreasing funding.